Have a blast at your next game night with the BEST family-friendly board games and card games! Who else loves game night?! Playing board games is such a great family activity – one that brings everyone together in a fun and completely screen-free way! We also LOVE having game nights with friends. In fact, we have a few friends that we regularly get together with for game night! Because of that, we’re always on the lookout for new great games and we love that they make perfect holiday gifts for the whole family. So, we’re sharing over 10 of THE BEST family-friendly games with you today! Though we don’t play all of these games with all of our kids yet, all of the games on this list have content that’s appropriate for the whole family. So we can play with our adult friends while the kids are around and there’s nothing questionable. The ages listed are the recommended manufacturer’s ages, but we’ve found that some of the games even work for ages just a bit younger than what’s listed depending on the kiddos’ ability levels! *Note – the list below contains affiliate links for your convenience. As always, I only share things that I use myself and truly recommend! 1. 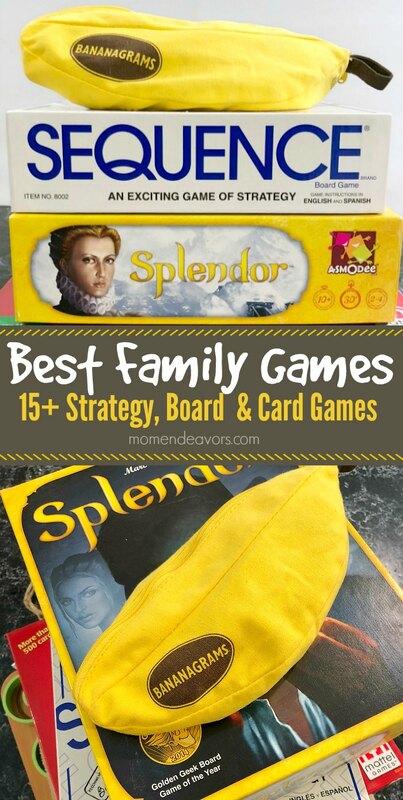 Splendor (Ages 10+) – This is our absolute favorite game and definitely a strategy game at that! It’s a little hard to explain how it all works, but essentially it’s a strategic economy game with cards and jewels/tokens. And it’s SO good! We were introduced to it by our brother. From there, we’ve shared the game with friends (who now all own the game as well). We HIGHLY recommend this one! And, for those that really like it, the Splendor Expansion pack gives you 4 additional ways to play the game! We love it! 2. Chickapig (8+) – This is a new game that we were sent to check out and it’s a lot of fun! I mean who doesn’t love a “pooping cow”?! LOL! 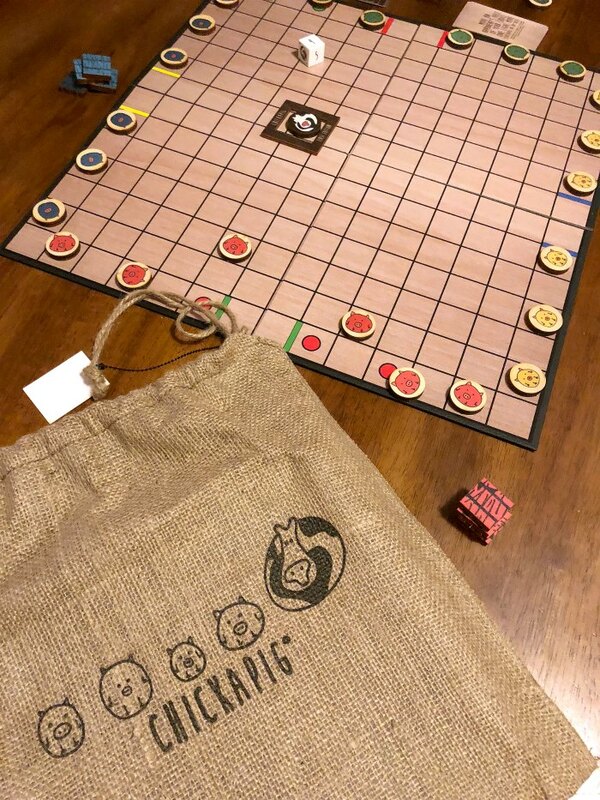 That’s right – you’ll dodge hay bales, opponents, and the pooping cow in this strategy game that’s sort of a twist on Checkers. And it’s actually created by some pretty famous people – Brian Calhoun (custom guitar maker to country and rock legends), joined forces with his farming buddy Dave Matthews to take his board game from farm (to tour bus) to tables across the country! So fun, right?! 3. Quirkle (6+) – This tactical strategy game is great for the entire family. We’ve had kids as young as 4 play (with help) alongside adults in their 90s! It’s easy to learn and fun to play. We love this one! 4. 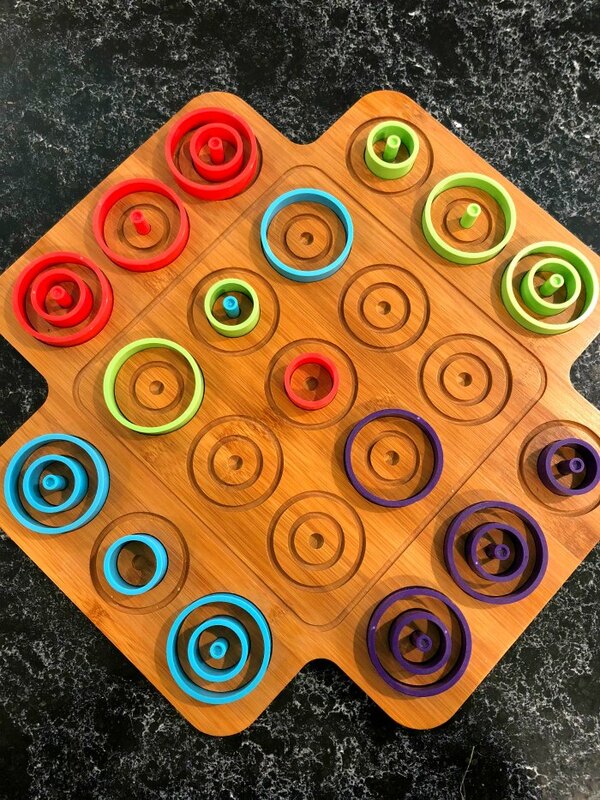 Otrio (6+) – Think you’re too smart for tic-tac-toe? Think again! Otrio is a crazy, good strategy game with a tic-tac-toe concept. So while the concept is simple in general, it’s often much trickier than you might think. We love that this game can be fast moving, yet big on strategy. It’s a fun one! 5. Dragonwood (Ages 8+) – We just recently got introduced to this one by some of our friends and we really liked it. It’s a card and dice strategy game that involves creatures and fantasy things like dragons. Its a simple concept overall – making it one that kids can pretty easily catch on to. Plus, the former teacher in me loves that it involves some basic math, so it’s great math practice for kids. 7. 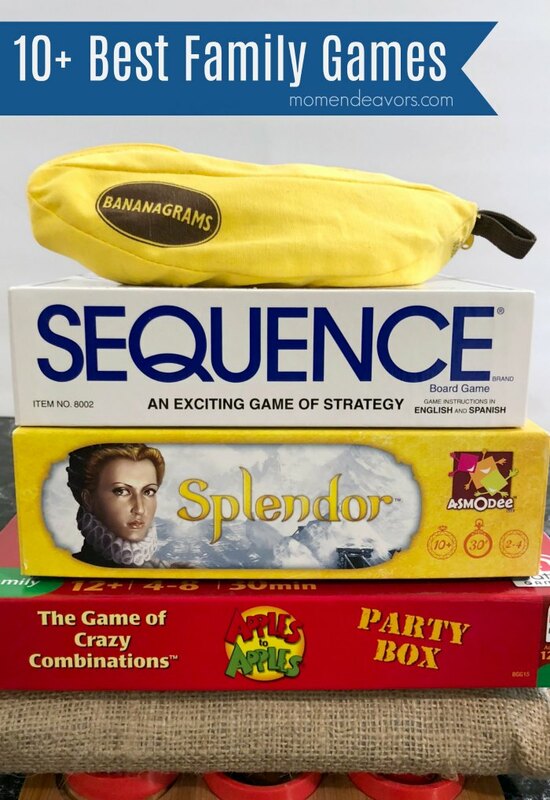 Sequence (Ages 7+) – This is a mix of a card and board game with a good amount of strategy. The game is very easy to learn, making it perfect for multi-generational game play. It’s also a great introduction to all the card deck numbers and suits for kids who aren’t yet familiar. If you like this general concept but have little ones, Sequence for Kids is a great place to start! 8. Ticket to Ride (Ages 8+) – This strategic board game is all about connecting train routes on a map (of Europe or the US, etc depending on which game version you have) to score points. There’s some definite strategy involved, but the overall concept is easy enough to understand that it’s a great multigenerational game. 9. Tiki Topple (Ages 10+) – This is the newest addition to our game arsenal and we really liked it. 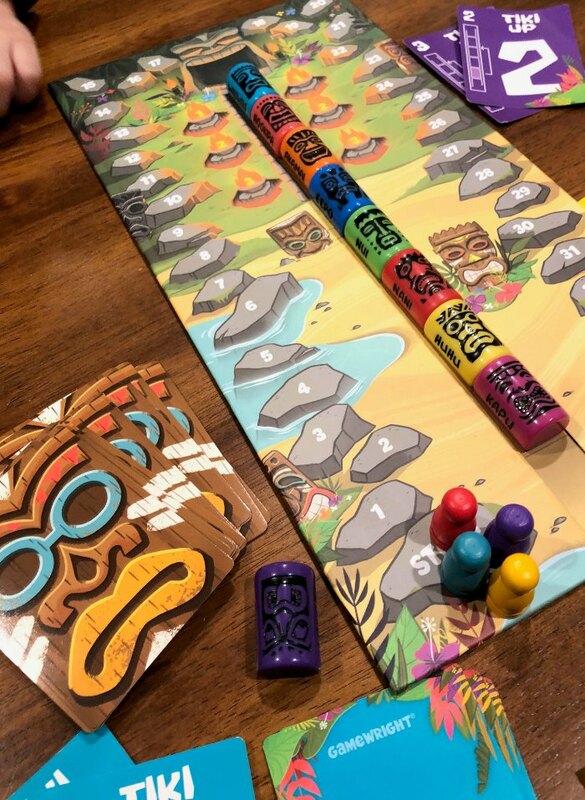 It’s a board and card game where the object of the game is to get your secret tikis to the top of the totem and score the most points. We played with ages 6 – 63 and everyone enjoyed it. 1. 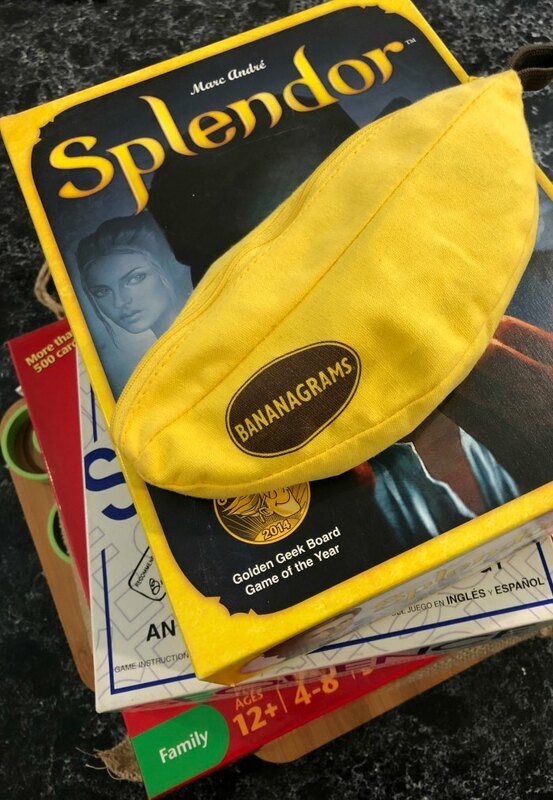 Bananagrams (Ages 7+) – This is like Scrabble, but your own personal board. We LOVE this game! It’s easily portable (we even bring it on cruise ships for fun family time) and something the whole family can enjoy! I LOVE that it’s a great game for kids to practice spelling and vocabulary building. 2. Tenzi (Ages 7+) – This is a SUPER fast dice game, fun for the whole family. It’s really a dice frenzy – which makes it something easy and fun to play. Tip – if you’re a family larger than 4 or regularly have game nights with friends, be sure to buy more than one set. I recommend having at least 8 different sets of colored dice. 3. Pass the Pigs (Ages 7+) – I’ve been playing this game for about as long as I can remember, only my family always called it “Piggies”. Essentially, two little pigs are the dice and you get different point totals depending on how the pigs land. It’s just simple family fun! 4. Apple to Apples (Ages 12+) – Apples to Apples is almost always good for a laugh. From the manufacturer, “Things (red cards) and Descriptions (green cards have two descriptions on each card). Each player takes turns being the judge and pulling the next Description card. The other players try to pick, from the cards in their hands, the Things they feel best match that Description—in the eyes of the judge (so it helps to know your judges a little better, too).” It’s good fun if you’re looking for something light-hearted where you don’t need to think too much. 5. Taboo (Ages 13+) – This is a word game that I happen to love (probably because my team usually wins every time I play 😉 ). The basic gist is that you are trying to get a teammate/partner to say as many words (printed on cards) as possible without saying any of the “taboo” words/phrases on the cards. It’s fast-paced and fun, but definitely requires you to think fast! 6. Codenames (Ages 14+) – This is another new game in our house, but one we REALLY like. Though it’s not really a strategy game like the ones above, it really requires some thinking. It’s basically just a word game with a really simple premise, but it’s actually surprising tough to play! 7. Harry Potter Hedbanz (ages 7+) – If you or your kids are Harry Potter fans, then this is a fun one! The Hedbanz game concept is easy to understand no matter what “theme” the game is. But as big Harry Potter fans here, this one is a huge hit and one the kids want to play often. So, I had to include it too! So, what do you think – Have played any of these games? Or do you have any other game ideas for us to check out? Let us know in the comments. We LOVE checking out new, fun games! Love this list of family appropriate games! We have a family game night once a month and all ages play, so we don’t want anything “iffy.” There are several games here that I’ve never seen before and they look like fun, so I’m adding them to my collection. Thanks so much! So glad this list was helpful! There’s NO “iffy” games here. Everything is family friendly – we LOVE these games! Enjoy!